This report from Sierra Wave media is pretty amazing. Don't forget that Tioga Pass is almost 10,000 feet, and that it often doesn't open until mid-June or later. Both Supervisors Tim Alpers and Board Chair Byng Hunt informed Sierra Wave Media of the good news. Alpers said that Yosemite officials told him they anticipate the opening of Tioga Pass by May 11th. He said they are now concentrating on clearing Glacier Point and Mariposa Grove since they are high priority visitation areas. Alpers said Park Service crews will start clearing Tioga Road April 29th from Crane Flat to the East. He said the crews have checked out Glacier Point and potential danger spots. Alpers said he was told there are “minimal to no avalanche areas.” The low snow this year will make clearance of the road easier. 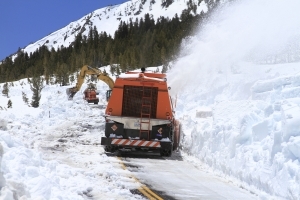 Barring unexpected additional snow storms, the Park Service now says they can handle the clearing of the pass road without help from Mono County road crews or CalTrans. That’s good financial news for both agencies. Alpers said the weather looks like it will remain clear, but this time of year, he said, you never know. The Mono Supervisors remain supportive of signing a cooperative agreement with Yosemite on an annual basis to help clear the road, which is an important route for tourists to travel into the Eastern Sierra. When Yosemite initially said they could not open Tioga Pass until after Memorial Day, Tim Alpers contacted the Park Superintendent to say the economy has already suffered in Mono County, as in many places. He told the Yosemite official that late opening of Tioga would add to the problems.